It would probably be an understatement to say I'm not a gamer. Last console I got was a Game Boy, 22 years ago (IIRC). Never got a gaming PC. I have 4 games on my Mac, and one is ASCII based. But my main source of mindless leisure for the past 7 years, aside from reading, has been playing with some iDevice. From an iPod Touch back then to my current iPhone and iPad Pro, playing, for me, has been Apple. Mostly strategy games, occasionally getting some simulator or arcade depending on how good it looked and how well designed for touch it seemed. Recently, though, I got a MFI (Made for iDevices, I guess) Bluetooth controller (affiliate link to Amazon: SteelSeries Nimbus). It has made playing the games it is compatible with impressive. Case in point, yesterday I finished playing the outstanding Forma.8 Go an open world exploration-driven platformer. I had started playing it several months ago, and stopped by the frustration at my inability with touch controls. Mind you, they are very well designed, it's just that I could not adjust to them. Playing with a controller was a totally different experience, much more enjoyable (looking at you, Downwell). It is rechargeable (have been using it for a couple of weeks and so far the battery has not depleted... as I said, I'm not a huge gamer) and works with iPhones, iPads, Apple TVs and even with Mac's, although for older games you will need several tricks (first, a converter from MFi to HID you can compile from this github repository, and depending on the game a HID remapper tool like Enjoyable, with these two I could almost play Reassembly... I will try to play following another path, but with this I could play old DOS based games instead). 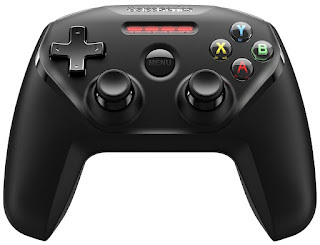 Sadly, not all games support controllers, they have to be specially programmed for it. For the ones that support it though, playing with a controller is way more fun, which has made the purchase totally worth it, even if I play less than 2h/week on average. Be sure to check which games are available (and which you already own and like!) before getting it to avoid a letdown. Oh, and in case you are wondering... neither PES 2018 nor FIFA 18 support it, sadly. NBA 2K18 seems to do, but I have not purchased it yet to try. Some of the GTA titles do, as well as the iOS classics Thomas was Alone and Galaxy on Fire 2. Oh, and in case you prefer different kinds of controllers, there are plenty to choose from. Some convert your iPhone in what looks like a weird PSP, or have a clip to hang your phone. Can't vouch for them: the Nimbus feels high quality.